- Rachel tried to be extra nice to Finn in hopes of winning him back, but he made it clear that he's just too hurt. He's only had two girlfriends, after all, and both have cheated on him. - Sue rigged a game of Secret Santa to get all the gifts for herself. When Will and Beiste teamed up to take them back, Sue responded by dressing like the Grinch and stealing them away. In the end, however, she was moved by the Christmas spirit and helped organize a Christmas Eve party at Will's so her nemesis would not be alone on the holiday. - Most of the hour was spent with the group trying to make sure Brittany continued to believe in Santa. It was very sweet. But it also became a problem when she asked the big guy to make Artie walk. Somehow, though, someway, a special device that did allow him to briefly take a few step was present under the tree when the day arrived. 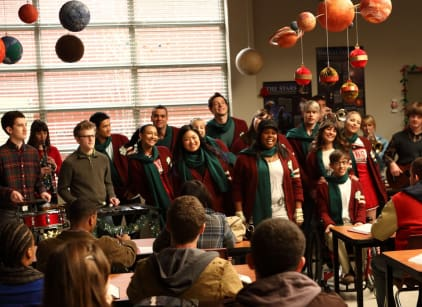 It was a Glee Christmas miracle! Brittany: Remember: even the smallest envelope is heavy for an elf. Permalink: Even the smallest envelope is heavy for an elf. Last year I left my stocking up over Christmas vacation and an entire family of mice starting living in it. Their Christmas gift to each other was rabies.